Unison members working within estates and facilities at Mid Yorkshire hospitals Adrian Oâ€™Malley, branch secretary, Unison Mid Yorkshire Health NHS Trust were due to start three days strike action against the formation of a wholly owned subsidiary company (WOS) on Monday 20 August. 900 staff were at risk of being transferred into the proposed company. The Unison strike vote was 97.4% to strike on a 56.7% turnout. A further 100 staff have since joined the union to take part in the strike. Just last week the Trust had announced it could not proceed with the formation of the company this financial year due to not getting permission from NHS improvement but were still looking at forming a company at a later date. 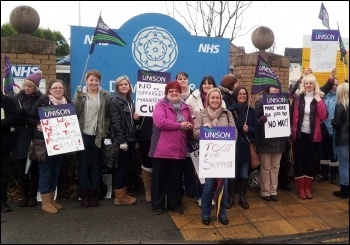 Staff briefings were held on Tuesday and Wednesday last week, at which senior managers were left with no doubt about the strength of feeling against the WOS by workers angry about the possibility of being moved â€œoutside the NHSâ€�. This, alongside the messages that were coming back saying the strike of the 500 plus Unison members would have been rock solid, resulted in a change of mind by the Trust Board and letter going out to Trust employees confirming that all work on forming a WOS had ceased. After agreeing a joint statement that all work on the WOS, now and in the future, had stopped the strike was lifted. This has been seen as massive victory by our members. The only complaints we have had are from members who were looking forward to three days on the picket lines! Following the successful strike in Wigan, Wrightington and Leigh against their WOS itâ€™s another battle won in the war against privatisation of the NHS. It sends out a message that if you stand together, are prepared to fight together and if necessary strike together you can win. We need to continue this battle across the country to stop any future WOSâ€™s being formed and return the workers in existing companies back into the NHS. This version of this article was first posted on the Socialist Party website on 14 August 2018 and may vary slightly from the version subsequently printed in The Socialist.